61 full size LED keys. 200 tones and rhythms, 8 unique drum sounds. Single finger/fingered chord. Record, play, program and playback. Double stereo speakers. Music rest included. Music book and keyboard stand are not included…. This toy costs approximately £59.99 (for the latest and best prices make sure you check our retailer list for the SK-20066 61 Key Keyboard above). 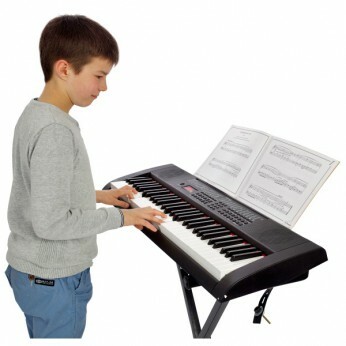 In our review of SK-20066 61 Key Keyboard we classed it as being suitable for ages 3 years, 4 years, 5 years, 6 years, 7 years, 8 years but recommend you check the manufacturer specific advice before purchasing.